While most people may tend to associate the history of Italian Americans in the U.S. as an East Coast experience, an important yet largely unknown chapter of Italian American history took place in California, and more specifically in Los Angeles – with traits unique to the West Coast. 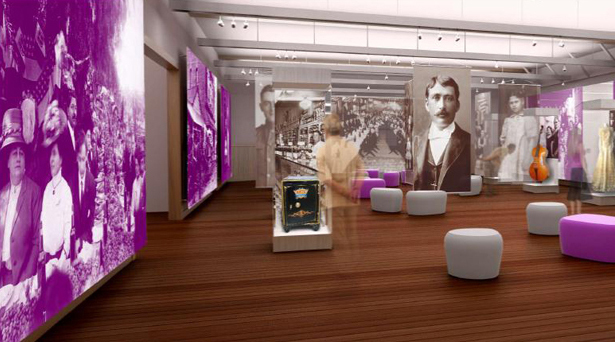 The Italian American Museum of Los Angeles (IAMLA), slated to open in 2015, aims to explore that history, highlighting the important contributions of Italians to the development of Los Angeles and the state of California. On a visit to L.A. this spring, I met with IAMLA Executive Director Marianna Gatto, a passionate historian of Italian American history in California, who has carried out research in the field for 20 years. 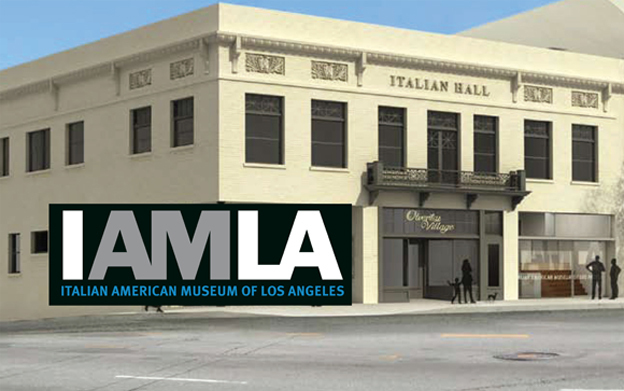 The IAMLA will be located in the Italian Hall, the oldest remaining building from L.A.’s Little Italy, overlooking Olvera Street, in the heart of downtown Los Angeles, what was once the core of the city’s Little Italy. Opened in 1908, it was the social and cultural hub of the Italian community between 1908 and 1950. After the 1950s, the Italian Hall fell into disrepair. In the 1990s, it was slated to become a commercial store. However, the local Italian community, eager to preserve the building, and with it its history, started to raise funds to restore it and turn it into a museum. 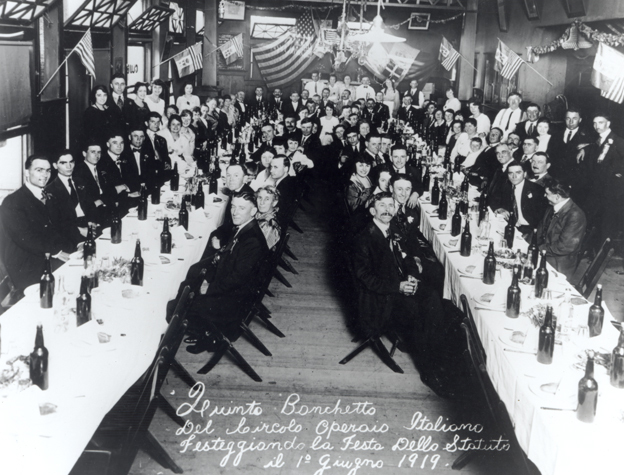 The Italian Hall was used to host cultural events, wedding receptions, club parties and as the headquarter of important organizations such as the Garibaldina Society and Il Circolo Operaio Italiano (Italian Workers Club); to honor its past, the IAMLA intends to transform the building into a vibrant Italian community center again, hosting lectures, festivals, meetings and a variety of events. The Italian presence in L.A. can be traced back to 1827, more than two decades before California became part of the United States. The Italians who arrived at that time found a largely Mexican-Californio community because California was still part of Mexico. They learned Spanish before they learned English and were quick to assimilate because they shared so many similarities with the Mexicans – language, religion, cultural practices. They were able to buy land, intermarried and achieved upward mobility more easily than Italians on the East Coast, who suffered more prejudice and were often forced to live in segregated communities. Between 1860 and the early 1900, L.A. became the wine capital of the country, producing large amounts of wine. Many of the wineries were located on Olvera Street, which was originally known as Vine Street. Many Italians became successful winemakers, including Secondo Guasti, “a total American dream story,” Gatto told me, recounting his story. Arriving from Italy with three of his paesani and a dollar in his pocket, he began working as a cook on Olvera Street, then got into the wine business. Convinced he would find water in the dry terrains of Rancho Cucamonga, east of Los Angeles, he bought land there, found the water, planted vineyards, and created the Italian Vineyard Company, which would become the world’s largest winery of the time, shipping all the way to Europe, and making Guasti one of the world’s richest men. Today, a California town in the area, Guasti, is named after him. IAMLA will showcase the stories of Italian Americans like Guasti and many others who, like him, enriched the history of Southern California. 4,000 items, from historical photographs to memorabilia, spanning a time period from the 1800s to the present will be displayed. The permanent exhibition wing will feature glass panels attached to the wall that are motion activated, so when the visitor approaches them, they start projecting content and images. Working closely with the Italian government, the museum will also feature temporary exhibits on a range of topics. There will be an education center for the teaching of Italian language classes, as well as an oral history and genealogic research center. “It’s very 21st century and we like the dichotomy between this old building and this very new technology,” Gatto said as she walked me through the museum. 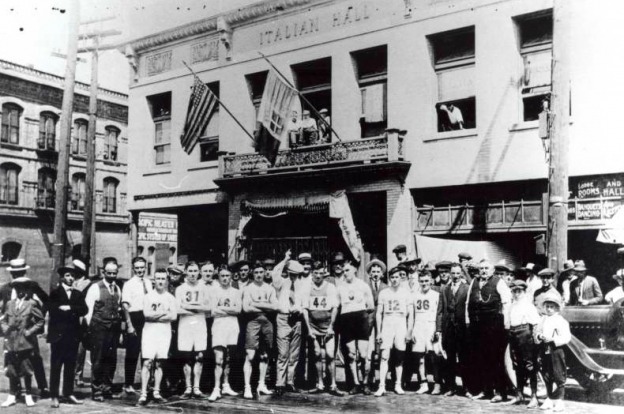 For more information about the Italian American Museum of Los Angeles, visit the museum's website. For donations or to contribute to the project, click here. Stay tuned as we will cover IAMLA's opening and future events. If you live in Southern California, don’t miss IAMLA’s annual event Taste of Italy, taking place October 11 in L.A.’s historic Little Italy. A fundraiser for the museum, the event features some of the best Italian restaurants and wineries of the area. Tickets can be purchased here; for updated event info, check the IAMLA Facebook page or the IAMLA Twitter page.